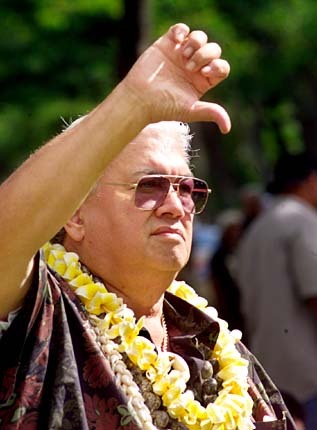 This Star-Bulletin story (Thursday, November 13, 2003) on the Kaho`olawe transfer ceremony at `Iolani Palace included the following picture of me, with the caption: "Activist Charles Maxwell gestured his disapproval as Adm. Walter Doran spoke during the ceremony." The reason I stood up with my hand raised and thumbs down when Admiral Doran spoke is because the Navy is lying to us again. I also said "aole Pono" meaning "it's not right." In documents agreed upon when 11 of us sued the Navy and won they had promised that they would clean the entire island and it would be safe for people to walk on. Only 2/3 of the island is clean. The most sacred valley Kanapou which contains birth rocks of women and man, an ancient symbol of Hawaiian stories, can never be accessed by the Kanaka Maoli, a real blow to our culture. Earlier this year our Hula Halau tried to do a ceremony for the Merrie Monarch Festival and we were denied access. Over the last 10 years millions of dollars was wasted by the Navy that should have gone to clean up the island. Workers were going on the island everyday to work and would do so only for 2 hours. They laid around reading books until it was time to catch the helicopter back to Maui. That is how the 460 million dollars was squandered by the Navy and even in his speech, Admiral Doran liee that the island can be enjoyed by the Hawaiian people. "Waha He'e" an old Hawaiian saying of a person who does not mean what he saying and like the 8 legs of the octopus, he speaks in eight directions.